Historically abundant, harbor seals nearly disappeared from Narragansett Bay due to hunting and other environmental pressures. The Marine Mammal Protection Act of 1972 made it illegal to hunt or harass these creatures, and their numbers have rebounded and returned to their historical range. In 1994, Save The Bay’s Wenley Ferguson enlisted the help of volunteers to gather observations on this once-more abundant top predator of the Bay. They identified popular “haul out” sites where seals liked to rest, and every two weeks during the winter seal season counted the hauled-out seals at low tide. Since 2009, an annual Bay-Wide Seal Count has been held on a single day near the peak of the season when all haul-out sites, even ones that are too difficult to access for regular monitoring, are visited at low tide. When I came on board in 2013 as Save The Bay’s volunteer and internship manager, it was my pleasure to continue this project and work with the dedicated volunteers who make this program possible. Every winter they head out to the shore with binoculars and winter gear to keep tabs on our seals. At this point, we had 20 years’ worth of seal observations in an Excel spreadsheet. While the data we collected informed our own understanding of harbor seals in Narragansett Bay, and although we also shared these observations with marine mammal researchers, we felt it was time to share our observations in a more easily accessible, visual format. Therefore, Save The Bay launched our annual seal report, full of photos and graphs that help us visualize the seal monitoring data. And what does the data tell us? 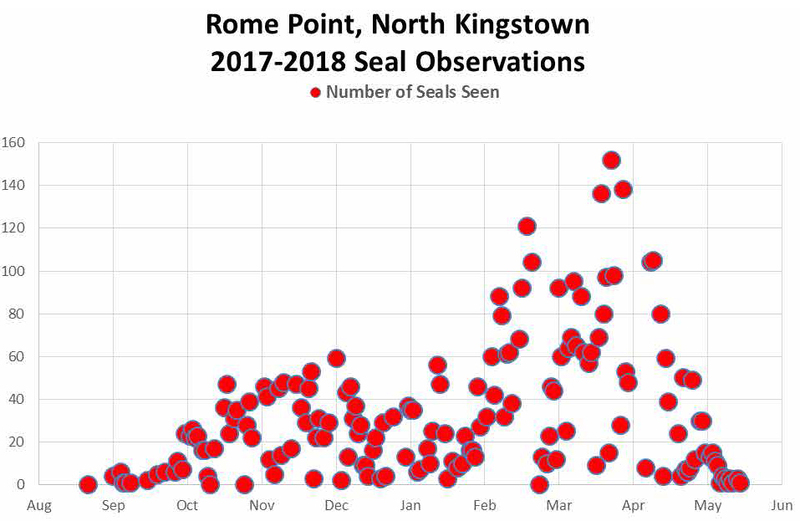 Seasonal monitoring confirms that seals begin to arrive in Narragansett Bay in September, with numbers slowly increasing to a peak in March, before dropping off sharply in April as they leave Rhode Island for parts north. By May, seals have left the Bay. Meanwhile, our Bay-Wide Count gives us a minimum estimate of the seal population. While we do not know what percentage of seals are hauled out at any given time, counting the ones that are hauled out gives us a minimum estimate of the seal population of Narragansett Bay at its peak—that is, if we count 423 seals, as we did in the 2018 Bay-Wide Count, we know that there are at least 423 seals in the Bay. 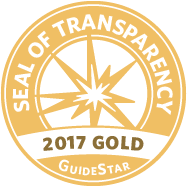 While year-to-year seal numbers vary because of monitoring conditions (the record was in 2016, with 603 seals counted), there is no upward or downward trend. 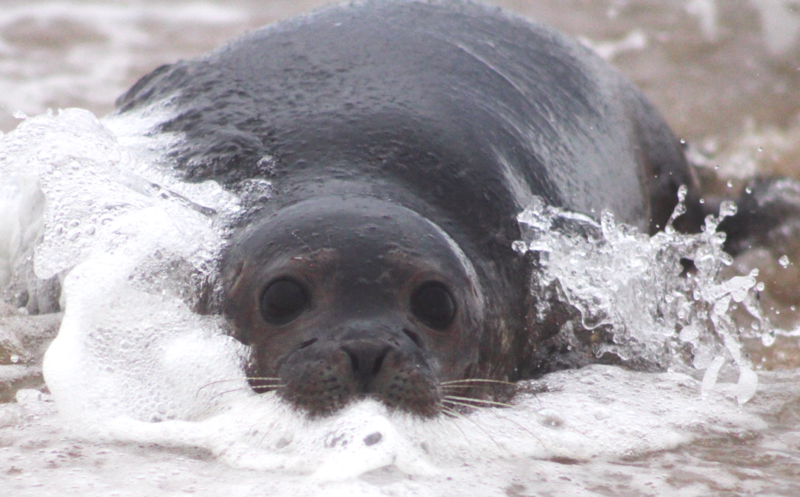 Overall seal numbers appear to be stable—which is good news! Ongoing monitoring by Save The Bay’s volunteers will help us be alert to any future changes affecting seals in the Bay. 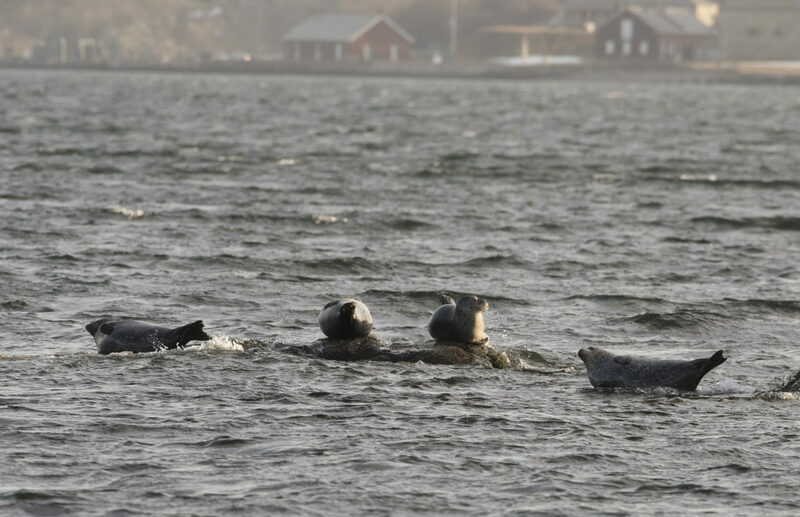 Seals “hauled out” in Narragansett Bay, taking on the classic “banana pose” resting position. One of the features of a long-standing citizen science project like this one is the continual effort to make it even better. Recent tweaks to our monitoring protocol include extending the monitoring season so we can be more alert to changes that may occur in the arrival and departure time of seals, as may occur with climate change. And, starting this year, we are partnering with the Nature Conservancy to include seal counts on Block Island in our monitoring program! The results of the expanded count will be included in the 2019 report. As long as there are harbor seals in Narragansett Bay, you can rest assured that Save The Bay volunteers will be out there every winter to monitor them. And Save The Bay will be here to report what we find!